North Korean leader Kim Jong Un arrived in Vietnam on Tuesday for a summit with U.S. President Donald Trump where they will try to reach agreement on how to implement a North Korean pledge to give up its nuclear weapons. 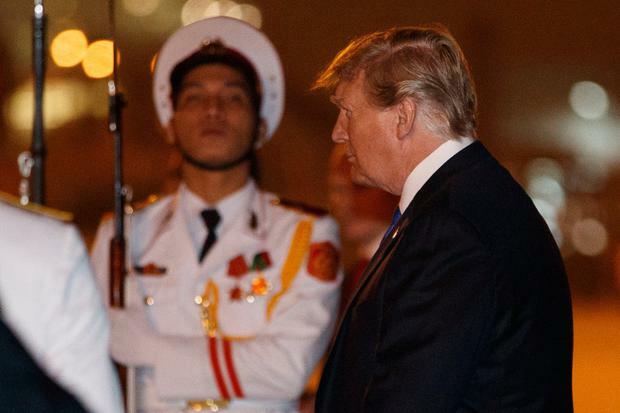 Trump flew into Hanoi on Air Force One, touching down just before 9 p.m. (1400 GMT). They will meet for a brief one-on-one conversation on Wednesday evening, followed by a dinner, at which they will each be accompanied by two guests and interpreters, White House spokeswoman Sarah Sanders told reporters on Air Force One. The two leaders would meet again on Thursday, she said. Kim arrived by train early in the day after a three-day, 3,000-km (1,850-mile) journey from his capital, Pyongyang, through China. He completed the last stretch from a border station to Hanoi by car. Their talks come eight months after their historic summit in Singapore, the first between a sitting U.S. president and a North Korean leader. There is likely to be pressure on both sides to move beyond the vaguely worded commitment they made in Singapore to work toward complete denuclearisation of the Korean peninsula. Domestic critics have warned Trump against cutting a deal that would do little to curb North Korea's nuclear ambitions, urging specific, verifiable North Korean action to abandon the nuclear weapons that threaten the United States. Kim, who travelled from the North Korean capital by train, arrived at the station in the Vietnamese town of Dong Dang after crossing over the border from China. Vietnamese officials were on hand to receive him at the station with a red-carpet welcome, including a guard of honour and fluttering North Korean and Vietnamese flags. Kim's sister, Kim Yo Jong, who has emerged as an important aide, arrived with him. About a dozen bodyguards ran along side Kim's car as he departed for the two-hour journey to the capital, Hanoi. Roads were closed off with Vietnamese security forces equipped with armoured-personnel carriers guarding the route to the city's Melia hotel where he is staying. Both Kim Jong Un and Trump are also due to hold separate talks with Vietnamese leaders. U.S. Secretary of State Mike Pompeo also arrived in Hanoi, on Tuesday. He has been Trump's top envoy in his efforts to improve ties with the reclusive North and has made several trips to Pyongyang to negotiate an ending of its nuclear programme. Pompeo was due to meet U.S. Special Representative for North Korea Stephen Biegun in Hanoi later. Trump told reporters before he left he and Kim would have "a very tremendous summit". Tweeting on Monday, he stressed the benefits to North Korea if it gave up its nuclear weapons. "With complete Denuclearisation, North Korea will rapidly become an Economic Powerhouse. Without it, just more of the same. Chairman Kim will make a wise decision!" Trump said. In a speech late on Sunday, Trump, however, appeared to play down any hope of a major breakthrough in Hanoi, saying he would be happy as long as North Korea maintained its pause on weapons testing. "The most basic yet urgent task is to come to a shared understanding of what denuclearisation would entail," said Gi-Wook Shin, director of Stanford’s Asia-Pacific Research Center. While the United States is demanding that North Korea give up all of its nuclear and missile programmes, North Korea wants to see the removal of the U.S. nuclear umbrella for South Korea. A South Korean presidential spokesman told reporters in Seoul on Monday the two sides might be able to agree to a formal end of the Korean War, which was concluded with an armistice not a peace treaty, a move North Korea has long sought. While a formal peace treaty may be a long way off, the two sides have discussed the possibility of a political declaration stating that the war over. Protesters in Seoul tore up photographs of Kim and threw them to the ground to highlight their dismay that North Korea's grim record on human rights was not expected to figure in the discussions. About half of 451 North Korean defectors questioned in a survey endured physical violence at the hands of North Korean authorities before they fled, a rights group. Rights group Amnesty International said Trump had disregarded human rights to gain favour with Kim. "His silence in the face of relentless and grave human rights violations has been deafening," it said.